Refinance your auto loan from another lender and you first payment isn't due until the weather is warm! Plus, get a low rate, a low monthly payment and no payments for 90 days. Auto loan rates are now as low as 1.79% APR* for a 35-month term and as low as 2.75% APR* for a 59-month term. Community First has three Certified Financial Counselors to help you develop a financial plan, pay down debt, and build wealth. Patti, Rene, and Gail are certified by the Credit Union National Association's Financial Counseling Certification Program (FiCEP). 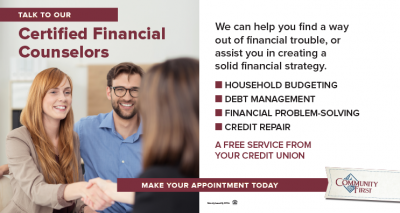 Call 440-997-5919 to schedule your free consultation or read more on our Financial Counseling page. Community First CEO Mark DeGeorge and CFO Philip Pawlowski this week presented a donation to Judy Summers of Blessings in a Backpack, which mobilizes communities, individuals and organizations to provide food on weekends for elementary school children who may otherwise go hungry. Community First can help you finance college or other education. In partnership with Sallie Mae, we offer the The Smart Option Student Loan to members. This loan features three repayment options, competitive interest rates, and no origination fees. Take control of your Debit Card with the CardValet App. Our new CardValet app lets you control your debit card, save time and gain peace of mind knowing you can control your card with the phone in your pocket. • Turn your debit card on and off. • Establish transaction controls for dollar amount limits, merchant categories and geographic locations. • Receive alerts when your debit card is used, approved or exceeds the transaction controls set by you. • Stay informed of potential fraud with alerts on attempted, declined transactions. • Get real-time balances for your accounts. At Community First, you are not a number, you are a member! Perry Schools Superintendent Jack Thompson is a member. He has pursued greater heights in his life and career. Over a career of 29 years spanning seven school districts, Jack has only needed one Credit Union – Community First Credit Union. He obtained his loan digitally, never had to come in to sign, and he has always received great service – so why change? Thank you, Jack! Congratulations to Elizabeth, a member who won $500 in Community First Credit Union's Auto Loan Transfer Drawing. 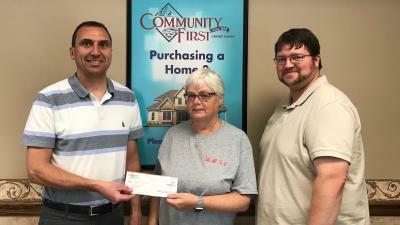 Community First also donated an additional $500 to Elizabeth's local charity of choice, Habitat for Humanity. Elizabeth transferred her auto loan from another lender and got a lower rate at Community First, which will save her a lot of money over the life of the loan. You can use No-Fee ATMs all over town! Withdrawing money from an ATM can be expensive. Surcharges and fees can cost as much as $3.50 per transaction. If you use ATMs frequently, you could save a lot of money with your Community First ATM/Debit Card! See all the No-Fee ATM locations in Ashtabula County. If you prefer smartphone apps, you can download ATM locator apps for CU24 and Alliance One and have thousands of locations at your fingertips. You have access to two nationwide networks of surcharge-free ATMs. That means you can find thousands of ATMs in town, near your workplace, or while traveling. Read more and download the ATM locator apps. 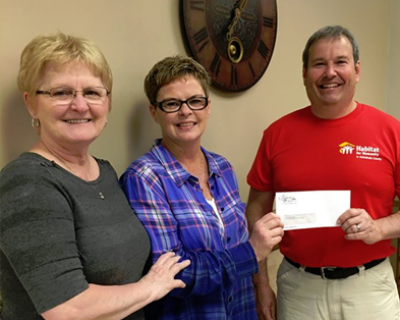 Community First Credit Union staff and members donated $1,500 to local food pantries this month to help hungry neighbors in our Ashtabula County community. CFCU donated $500 to the Messiah Lutheran Food Pantry. Members bought chocolate bars from our staff to raise the funds as part of a Northeast Credit Union Outreach Alliance program. On behalf of our members, we thank our friends at the Food Pantry for their work and are happy to be able to help! We are still selling chocolate bars to raise more money, so stop in and help your community (and your taste buds)! Our staff this week donated $500 to the Conneaut Food Pantry and $500 to the St. Joseph Food Pantry in Ashtabula to help our community during the holidays. Community First staff members donate money each Friday to wear jeans and give back to the wonderful people of Ashtabula County. We are disbursing the year's funds to several area organizations this month. Membership in Community First Credit Union is open to anyone who lives, works, worships or attends school in Ashtabula County. Families of members can also join. Just stop by our office and make a minimum deposit to open your savings account, and you can be a member/owner, too!